Shield: Parted per fess or and gules two gauntlets argent overall fingers pointing to chief, thumbs to fess point. In chief three artillery shells of the second, all points to chief. Description: The colors yellow and red are for Ordnance. 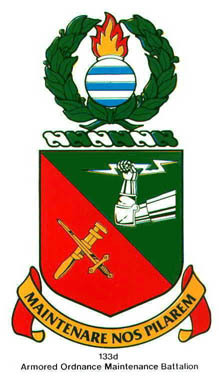 The two gauntlets allude to the 11th Armored Division and their attitude symbolizes the support nature of the unit. The three artillery shells further symbolize this function of the battalion to supply ordnance services to the division as well as the battalion’s participation in the Ardennes, Rhineland, and Central Europe Campaigns of World War II.